Singer SM 1500 Saloon continue virtually unchanged from previous year, during which the interior had received a face-lift and the engine was given a reduction in stroke (89.4 v. 90 mm) to bring it under the 1500-cc rating (1497 v. 1506 cc). This engine modification also apply to the export-only Roadster 1500. 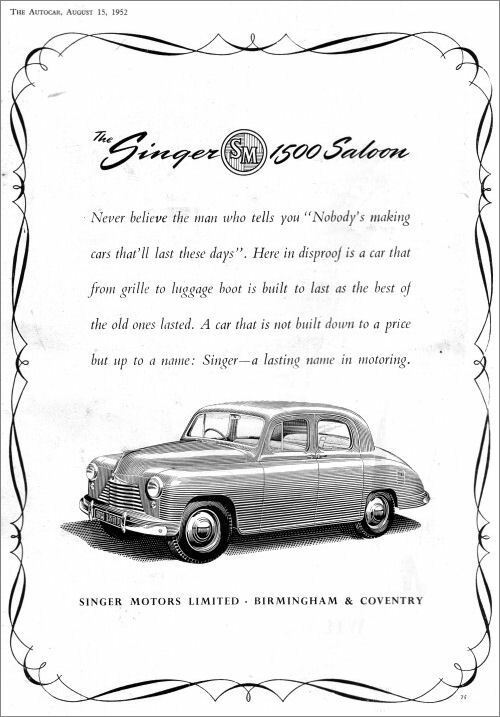 The SM1500 Saloon was originally introduced in 1948. 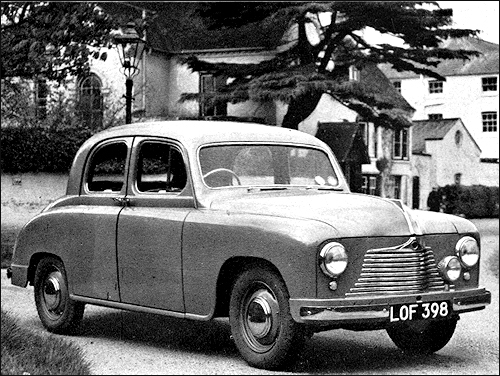 In January 1952 the headlamps were raised and rear window was enlarged. 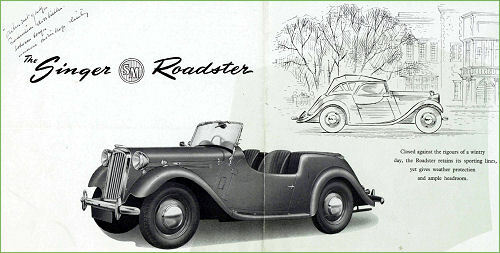 From September 1952, Roadster have twin carb option gave 58bhp and 80 mph top speed. 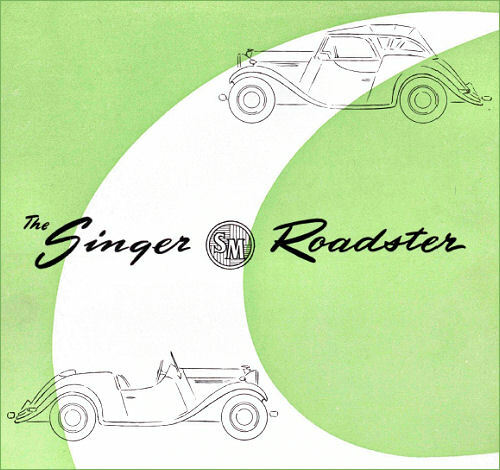 An interesting innovation in the Singer range for 1953 is the introduction of a two-carburettor edition of the 1,500-c.c. engine. This is available as an optional extra on either the SM 1500 saloon or the 4AD Roadster, the latter car continuing, as before, as an export-only model. Apart from one or two very minor changes, this Roadster model continues in existing form, but several notable improvements which affect both appearance and user-convenience are to be found in the SM 1500 saloon. A very useful increase in power output is obtained with the two-carburettor engine, the increase representing an additional 10 b.h.p. and bringing the output from 48 b.h.p. at 4,200 r.p.m. to 58 b.h.p. at 4,600 r.p.m. The increase (equivalent to over 20 per cent. at peak) applies throughout the range, although to a minor degree only at low speeds; the extra power begins to come really noticeable at about 3,000 r.p.m. where 3 extra b.h.p. is available, rising to nearly 8 b.h.p. at 4,000 r.p.m. and to the full 10 b.h.p. at peak, as already stated. The existing o.h. camshaft unit lends itself particularly well to the use of two carburettors. As before, the inlet valves are on the nearside and the exhausts on the offside, each of the latter having its own separate port with a short passage running across the head to mate up with the manifold; no separate inlet manifold is used, distribution being within the head casting. On the standard single-carburettor edition, an initial central branch pipe (which forms an integral part of the exhaust manifold and thereby provides a localized hot spot) is used. With the two-carburettor design, this arrangement is duplicated by a modification of the manifold casting, the two-carburettors feeding to the internal passage which also serves as a balance pipe. Minor alterations which go with the two-carburettors are an increase in compression ratio from 7.0 : 1 to 7.4 : 1, the use of a distributor head incorporating vacuum advance and retard control in addition to the normal centrifugal mechanism and the fitting of harder plugs to suit the higher-output effects. In the case of the Roadster model, slightly higher gear ratios are used when the special engine is fitted, the top gear being raised from 4.875 : I to 4.44: 1, with corresponding variations in the indirect ratios. 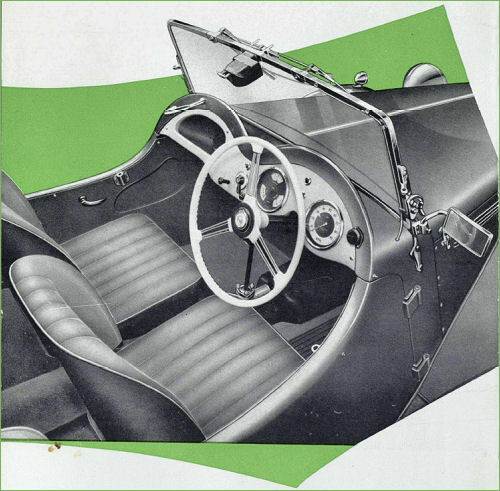 In other respects, the Roadster remains unchanged apart from the adoption of a Vynide-covered instrument panel instead of the former polished wood. It is worth noting, however, that Roadster models have for some time been fitted with an ingenious spring-loaded arrangement of hood sticks which serve to ensure that the fabric is taut when the hood is erected. 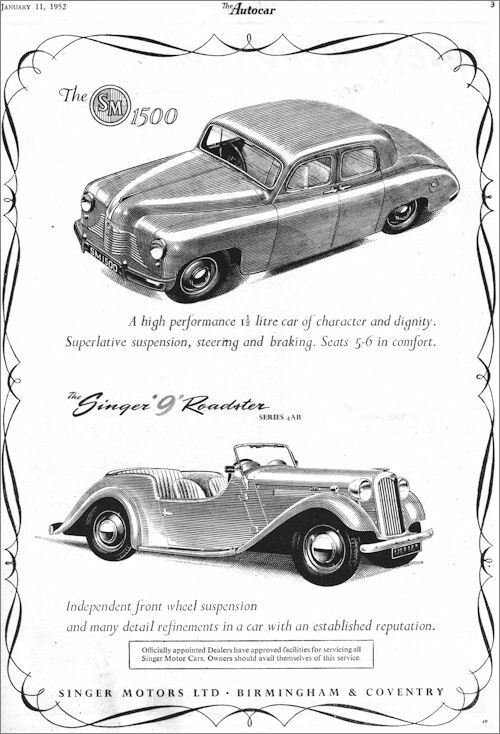 The SM 1500 saloon improvements for 1953 may be divided into external and internal changes. Most noticeable of the former is the use of new bumpers of much more attractive design. In section, they are slightly wedge shaped with flanges at top and bottom and, in addition, are provided with over-riders as standard, these being located to flank the number plate and connected by bars. The bumpers, which follow the same style at both front and rear, are also provided with a good wrap-round for adequate wing protection. Although not at first very noticeable, the radiator grille has also been modified by the use of slats of a V-section in keeping with that of the new bumpers, the whole effect being to enhance appearance very noticeably. From the rear, the latest SM 1500 models are also distinctive by reason of a larger rear window. This has a maximum depth approximately 2 in. greater than the old, whilst the width is increased by some 3 in., a further increase in area being brought about by the elimination of the downward slope of the top edge on each side. Thus, the new window not only gives a greatly improved rearward view but also, by its more rectangular shape, blends better with the rear contours of the car. Door locking arrangements have been improved by the adoption of a press-button mechanism with fixed handles, the new locks also incorporating an anti-rattle device in the form of a spring-loaded wedge which provides positive vertical location when the doors are closed. A small, but useful, modification has been made to the "extractor" ventilation panels on the front doors. They have now been pivoted at the centre to permit them to be swung through an angle exceeding 90 deg., thereby making it possible for them to be used to deflect air into the car as well. The layout of the facia board as a whole remains unchanged, but circular dials (in place of the former rectangular type) have been adopted and the figures are now in dark brown on a cream face, making them both attractive and easy to read at a glance. On the left of the steering column there is a large-dial speedometer, immediately above the column is a clock and to the right, a combined dial, matching that of the speedometer, incorporates an oil gauge, ammeter and fuel gauge. In the rear, a considerable increase in knee room has been effected by recessing the rear portion of the front squab by 2¼ in. INTO the Singer Roadster is built a combination of qualities which are not usually found in one car. With distinctive lines, it has a powerful 1,500 cc. engine (available with single or twin carburettors) and a lightweight coachbuilt body, giving vivid acceleration and high cruising and maximumm speeds. A top speed of about 75 mp.h. (83-85 m.p.h. with the twin carburettor engine) and cruising speeds of 55-60 are normal. Economical performance (aboutt 30 m.p.g. at high cruising speeds) is a further important factor. Yet with all this go many of the advantages of a saloon car. 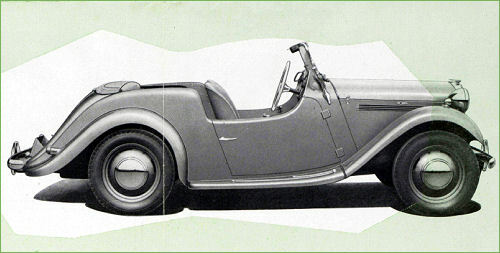 The Roadster is, for example,, an occasional four seater. Furthermore, the hood and side sereens are so designed as to provide closed-car comfort when the weather is unfavourable to open-air motoring. With the hood raised and screens in position, the Roadster retains its sporting lines and at the same time gives protection with ample headroom. It is at all times a joy to drive. Road-holding and stability, light but positive steering, excellent visibility — all add up to carefree and invigorating driving. And for sturdy construction, reliability, and years of service — the Singer name is sufficient guarantee.